The sessions start at 7.30 pm and finish at 9.30 pm, with a break for supper between the two presenters. Questions are invited and there’s time during supper to engage the presenters in conversation. 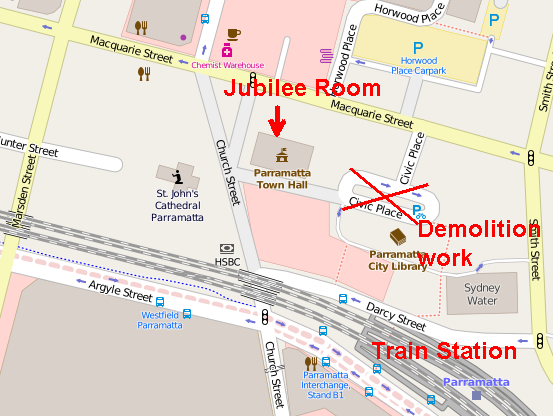 Due to demolition work at Parramatta Library the nearby Council car park is most likely not available. Metered parking is available in Macquarie Street. Car parks at 30 George Street and 1 Horwood Place are marked for demolition but may be still open in August (but check first).The car park at 15-17 Wentworth Street should be available for $9 for 3 – 3.5 hours. side and walk to the Parramatta Mall. While registration (no cost) is not essential we encourage you to register with the Parramatta Evening College online or by phone (9687 2072) since this helps with catering needs. Otherwise just turn up to any of the sessions when you can. A donation on the night would be appreciated to help cover costs of hall hire and publicity. Building Bridges provides an opportunity to come and hear both Indigenous and non-Indigenous presenters sharing their knowledge, expertise and personal experience in in informal and relaxed atmosphere. Many people have never met an Aboriginal or Torres Strait Islander Australian. Here’s your chance to meet them over supper and discover that there’s more to Indigenous society and culture than is often negatively portrayed in the media. While the Federal Government’s 2008 apology to the Stolen Generations was seen as overwhelmingly positive, both major political parties have ruled out any form of compensation unlike Canada’s conservative government which has provided $1.2 billion to its stolen generations ‘Canadian Natives’. The full effects of the 2015 budget cuts to Aboriginal programs is yet to be felt but they are already considered as detrimental to ‘Closing the Gap’. The Northern Territory Intervention (the so-called Emergency Response) which will likely continue until 2023, has created much controversy and it too seems to have had little effect on improving the lives of Aboriginal people. Natalie Cromb is a member of the the Kamileroi Nation of Burra Bee Dee Aboriginal Reserve near Coonabaraban. She has law and hostory degrees and has worked for 10 years as a full-time paralegal. She is critical of current political & judicial systems. Dr Heidi Norman is a decendent of the Gomeroi people of NSW. She is a Senior lecturer in the Communications Program in the Faculty of Arts & Social Sciences, UTS. Her research focusses on history, politics and the challenges of modernity. Dr Shelley Bielefeld is a Researcher at the UWS School of Law, with a keen interest in social justice, critical theory, race and the law, and the need for government accountability in areas of law and policy. Her recent research focuses on social justice issues affecting Indigenous Australians. Dr Howard Bath is a former Children’s Commissioner, Northern Territory, and has been highly critical of the NT government’s responses to the continuing and unacceptably poor outcomes for children and families particularly in rural & remote areas. Chris Burke and the Yarramundi Kids are dynamic storytellers and stars of stage and screen. Chris Burke, a Darug woman, is their creative director and puppeteer, bringing a playful approach to serious problems. Graeme Merritt is a Noongar man from WA. He is currently advocating against the WA Government’s announcement that it intends to close down araound a hundred and fifity remote Aboriginal Homelands and Communities. Graeme Cordiner is Secretary of Friends of Myall Creek and member of the National Committee. As a non-Indigenous Australian he is an advocate for an apology for the frontier wars and massacres. He is also involved with the creation of a Myall Creek museum. Leanne Tobin is the winner of the 2012’s NSW Parliamentary Art Price with her ‘Defending Country’. She only discovered her true identity as Darug while teaching at Jabiru. She believes education is better than fighting for recognition and teaches art in prisons. During the sessions a selection of books and other literature will be available for sale covering a range of Indigenous issues.